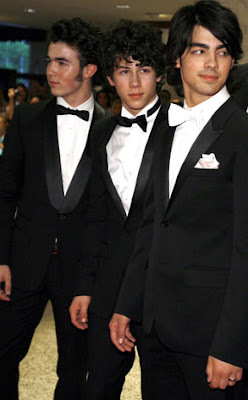 Jonas Brothers Fandemonium: How Do I Tell the Jonas Brothers Apart? “I cannot tell the Jonas brothers apart. Please help me. Easy. One’s the emo-looking one, one’s the quiet talent, one’s the…other one. I really don’t blame you for being confused. They all seem to wear the same tie. There are no designated sluts within the band because all three of them wear purity rings. It’s also really hard to find out who loves Jesus more, Kevin, Joe or Nick. • Nick almost always wears his hair curly, while Kevin, that wild man, may go either way. • If both Nick and Kevin are wearing their hair curly, and you REALLY NEED to tell them apart, Kevin is probably the only one of the two sporting sideburns. • In order of eyebrow heaviness: Joe (heaviest), Kevin, Nick. • Kevin is the oldest, at 21. Joe is 19. Nick is 16. • You may be able to tell them apart by their purity rings. Each of the rings supposedly reflects a unique personality. Kevin reportedly has a pseudo-rebel-style studded purity ring from Tiffany. Joe’s is said to be simple silver with a cross on it. Nick, from what I understand, got his mesh-style ring at Disney World. • Only Nick plays the drums. If you see the band playing, and there’s a Jonas brother on the drums, it’s most likely Nick. • Joe does not play the guitar. If you see a Jonas brother playing a guitar, it’s not Joe. If it’s a tambourine, however, it probably is. • Joe mostly just sings and flashes the puppy eyes. • Joe reportedly flat-irons his hair. Nick only used to flat-iron his hair. • Nick once dated Miley Cyrus. The other brothers, as far as I know, did not. • Joe seems, like, really wild onstage, but he’s like so quiet in real life. Kevin is the real extrovert. Nick is the core of the band’s talent, the chief songwriter and, by all accounts, the best musician.